The pricing for the week does include Sunday lunch at the Manor, and a buffet lunch at a local pub. Celebrating 40 years! 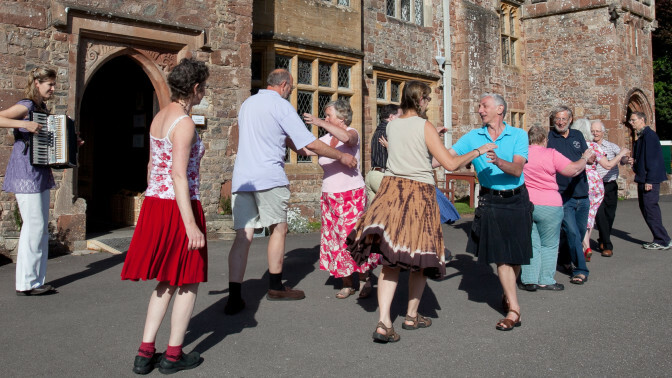 This popular dance holiday began as the ‘Guildford Folk Dance Holiday’ in 1977 and has continued to bring together dancers to enjoy folk dance, Halsway and its surroundings to this day. Hosted by Shirley Williams this country dance holiday is open to anyone who enjoys dancing and good company. Popular caller Carol Hewson will lead morning dance workshops and evening dances, with top-notch live music provided by Kelly’s Eye. During the afternoons there will be organised walks and activities, or you can relax and enjoy the Manor and its gardens, or explore the lovely area of West Somerset under your own steam. Please note that prices are half-board, but include Sunday lunch at the Manor, and a pub lunch & skittles on Wednesday. Dancers of all levels and abilities are welcome. Hosted by Shirley Williams with popular caller Carol Hewson. Kelly’s Eye: Brothers Graham and Kev Prigmore have been playing folk music together on fiddle, accordion, mandolin and bass since the mid sixties, and rhythm guitarist Steve Aldridge joined the band around ten years ago. They regularly perform at folk festivals, dance clubs, ceilidhs, weddings and barn dances. From a gentle waltz or hornpipe to the liveliest reel or jig, Kelly’s Eye play dance music that you just can’t sit still to. Their talent, experience and sense of humour, combined with a vast repertoire of traditional tunes from both sides of the Atlantic is guaranteed to turn any social event into a dance to remember.